We Design, Develop, and Implement Purposeful Play and Education Outside the Classroom Programming for governments and communities. Our global collaboration of organizations on 6 continents impact over 16 million young people in 110+ countries and more than 10 UNSDG’s. #WhatsYourLegacy? In 2019 Coaches Across Continents launched the first-ever global Organizational Accreditation Program for organizations using Purposeful Play and Education Outside the Classroom. Joining our award-winning Hat-Trick Initiative (HTI) each partner has access to our 28 year-round strategic resources. Our Purposeful Play and Education Outside the Classroom creates Legacies based on the UN SDGs. Our key to success is a unique Self-Directed Learning model that is based on our 'Chance to Choice' and ‘ASK for Choice’ curricula that educate people to identify, address, and solve problems specific to their communities. Coaches Across Continents uses a unique Self-Directed Learning model that educates people to identify, address, and solve problems specific to their communities. Over the course of the three-year partnership, we use annual benchmarks to monitor progress. 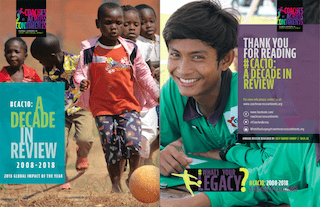 In the first year, we Educate on how to best use sport for social impact. In the second year, communities Adapt our curriculum to best suit their local needs. And in the third year, they Create a sport for social impact curriculum specific to their own community. Through ASK for Choice, Coaches Across Continents will: create an environment for the progression of Attitudes towards education and gender roles; the development of Skills for female leadership and problem solving; and an increase in Knowledge of gender policies. This will lead to educational, employment, entrepreneurial, financial, girls’ and women’s rights, and health Choices. ASK for Choice will enhance personal and community responsibility and produce locally owned and relevant gender equity initiatives. Coaches Across Continents’ strategic mentorship on curriculum and policy development will bring gender policies to life throughout communities by generating pathways to advance women’s and girls' participation, leadership, and rights in and through sport. Every CAC partnership has access to our 28 year-round strategic resources to Design, Develop, and Implement their own sustainable Purposeful Play and Education Outside the Classroom programming. In addition to the 11 Essential Resources, each organization must complete a percentage of the Elective Resources. The accreditation level is based on the number completed.